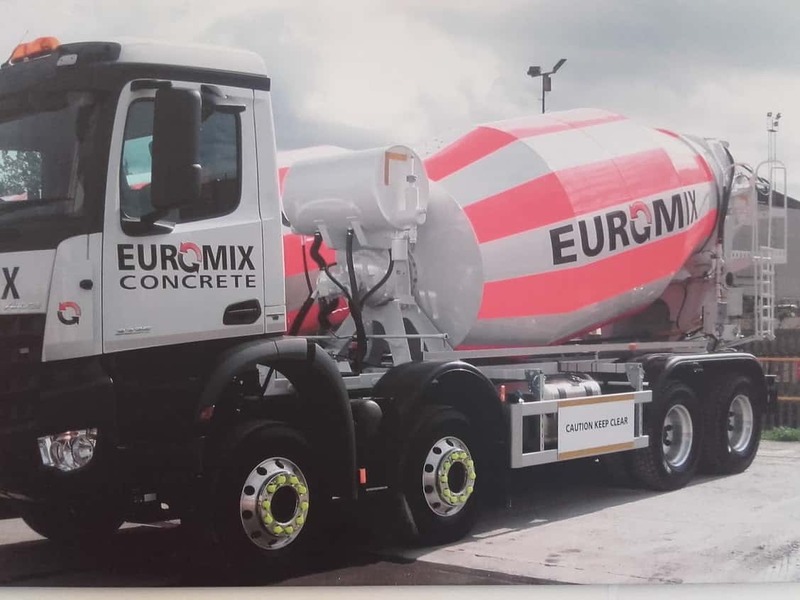 Euromix Concrete (a Subsidiary of Tarmac Trading Ltd) supplies high quality ready mixed concrete to the construction industry throughout London, Essex, Suffolk and Kent with central plants in London, Chelmsford, Thurrock and Ipswich. This case study provides an overview of our organisation, enhancements in our fleet and investment in our people, which as we strive towards FORS gold accreditation has provided a lasting benefit to our company. We have 58 truck mixers currently operating out of seven Readymix plants in and around London and a rural Essex. Our aim is a Zero Harm culture across Euromix and Tarmac as a whole, the health and safety of all whether it is an employee or member of the public is driving force for our business. We have introduced telematics, FTA Vision software, vehicle safety specific modifications and investment in training, which has helped us achieve improved driving standards and reduction in transport related fines. FORS is helping us achieve this by providing tools that challenge and focus our continual development. 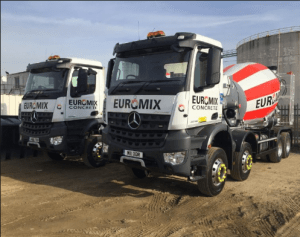 Euromix as a subsidiary of Tarmac joined the FORS scheme in October 2013, it was clear that the scheme would help us achieve the best practice across our fleet. It became an ambition of the transport team to strive forward with the applications for Silver and Gold status as a beacon of excellence to the wider company and adhering to the requirements of FORS, has given focus to achieve the improvements across our fleet. Our experience of the Bronze and Silver audits were a positive encouragement of our journey so far, we passed first-time round with a clear focus for processing on to the next stage. As a FORS accredited company, we made the most of the benefits on offer providing training for our team including utilising a variety of FORS training modules and tool box talks. These included Safe Urban driving, Person Safety in and around vehicles, Cycle safety e learning, and defects checks. These have been positively received by our drivers, who have taken greater confidence and understanding from the training provided. “The tools that FORS provide have been invaluable and have guided the toolbox talks to our drivers” Tim Peters, Transport Supervisor, Euromix. The FORS Workshops particularly the Safe urban driving and Cyclist safety, have been key in improving our driver’s knowledge and awareness of the potential risks to vulnerable road uses. In having these frank discussions on how our business affects the wider community has resulted in implementing a program to fitting safety signs to the underrun bars on all vehicles, thus educating and highlighting risks to the wider community and vulnerable road users. “Our driver training is now focused totally on FORS awareness from tool box talks on the website to D.C.P.C courses, Safe Urban Driving, Truck smart and E-Learning this way we know our drivers are getting the best delivered course” Ken Harris, Transport Manager, Euromix. *Annual improvement in MPG, Number of Incidents and Number of PCNs. Driver health and fitness review – Euromix (Tarmac) employed drivers are internally classed as operating in a ‘safety critical’ role and therefore must undergo an annual assessment. This covers both a ‘Fit for Work’ (FFW) assessment and a ‘Health Surveillance’ (HS) assessment e.g. one year it is the FFW, the following will be a HS. Tarmac employs an external specialist, Optima Health to complete these checks on our behalf. An overview of the status of the checks for each driver is shared between the organisations and any issues are discussed with the individual at the time and the line manager where applicable. In addition to the above other points of note are that our Drivers Handbook promotes the health and wellbeing of our drivers throughout plus a section that specifically refers to driver health. Strategy for recruiting drivers – We have invested in apprenticeships and academy schemes to offer opportunities and encourage young drivers’ male and female to provide them with a vocational licence and full training. There is a great satisfaction in giving someone the means to create a career and move forward in life. All drivers including those involved on the schemes above are taken through a structured program of training including vehicle manoeuvring, telematics and safe working, as well as completing a driver assessment before being signed off to drive alone. Noise assessment – as a business we have key responsibility to ensure our working operations do not impact negatively on the wider community. Each concrete plant has noise and dust surveys completed in line with BSI standards and as a transport team we have rolled out toolbox talks to educate the drivers on reducing noise pollution during driving, parking, loading or unloading, servicing or vehicle washing which is relevant to the vehicle type, load and sector. Modal shift and alternative vehicles – due to the nature of Ready mix concrete it is not suitable to be delivered by alternative methods. We have introduced Telematics and recording cameras into our fleet, this has increased our ability to monitor fuel efficiency and driving standards. Also, we continuously review the age of our fleet and the emissions that they produce and identify potential areas for new vehicle to be procured. To make continual fleet improvements, we have been investing in our Euro VI fleet, have completed a second chute refit to all our vehicles to reduce risk of injury to the operator, eliminating repeated mechanical and safety issues with anti-trap devices (finger guards). We also utilise the Enviroguard and washout system on our later vehicles to promote self-sufficient and water recycling operation reducing the possible impact upon the highway and the environment. We have identified vehicle telematics as an avenue for further development – we are hoping to roll out a live streaming system which will enable us to monitor all company vehicles, driver behaviour, awareness training promoting even higher standards to protect our drivers and take responsibility for the public. The benefits we have seen across our teams in terms of knowledge and empowerment has driven forward our standards. Receiving FORS gold accreditation would be a source of great pride as a transport team and demonstrates our ongoing commitment to excellence.